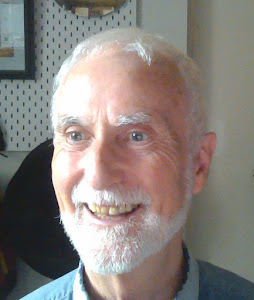 "Proinnsias" sounds the same as "Krunchie as," except with a P instead of a K. I was christened "Francis Killeen," but adopted the Irish form of this name "Proinnsias Ó Cillín." ("Cillín," which means "treasure," sounds exactly the same as "Killeen"). Some people have difficulty pronouncing "Proinnsias," and some children in my neighbourhood called me "Krunchie," a nickname that stuck. 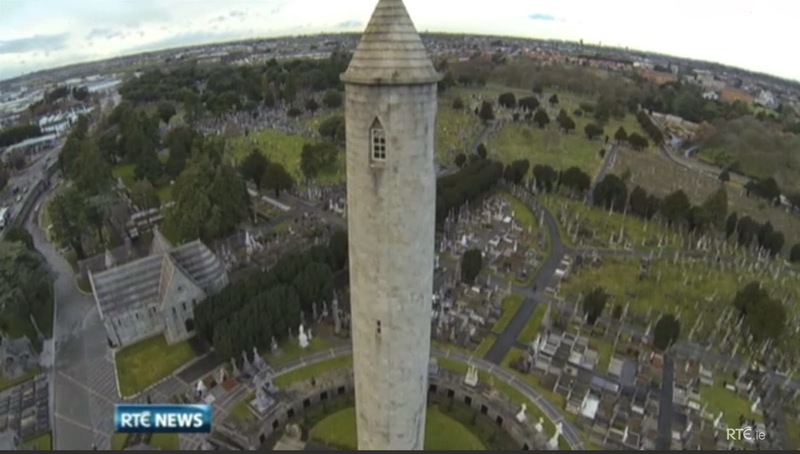 An UFO was sighted in Glasnevin - a miniature drone. You can control these things by an iPad or iPhone. Now we know what it was doing: filming by remote control. The occasion reported was the announcement by Junior Minister, Brian Hayes, of the project to restore the staircase to the O'Connell monument, which will allow pedestrian access to the top of the tower, offering the best view of Dublin ever. (Please forgive the media for wrongly blaming Ulster Loyalists, without a shred of evidence, for the bombing of the original stairs). Well, once upon a time there may have been such a tower in nearby Finglas. Though not as tall as O'Connell's tower, it was known as one of the two Eyes of Ireland, the other being in Tallaght. From these towers you had view of Dublin Bay, and from them the monks monitored the bay for sight of viking ships. (Well, maybe not. You could, perhaps, monitor Dublin Bay from Finglas, but from Tallaght? The "eyes of Ireland" may have been centres of learning rather than watch-towers. The O'Connell Tower is in a better position than Finglas for views of Dublin Bay). Both the monasteries (Finglas and Tallaght) were sacked by the Vikings. Two centuries later, Brian Boru set up his tent somewhere in the locality to oversee the Battle of Clontarf. 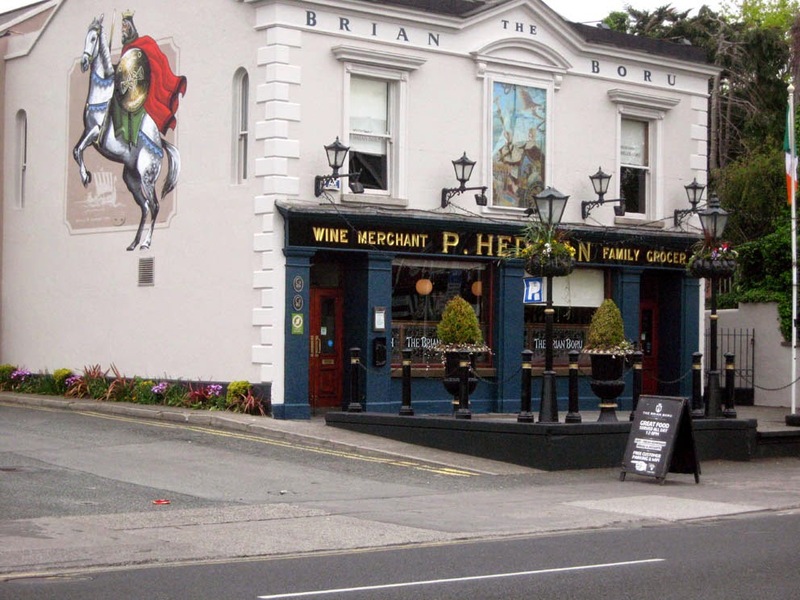 The Brian Boru pub (with its famous painting by Fergus O'Ryan) is located at one likely site of Brian's tent, because from there, if there were no buildings to occlude the view, one would have a view right down to Clontarf. Recently scholars have suggested an alternative site: within the bounds of Glasnevin Cemetery, right beside Dan O'Connell, and beside the Tolka river, which reaches the sea at Clontarf. If so, Brian chose badly, for there is a better view of Clontarf from the pub. The traditional story of the Battle of Clontarf is that Brian Boru, the great hero of Ireland, defeated the Vikings at the battle and saved Ireland from foreign dominion. The revised version told by modern historians is that it was the result of a rebellion by the king of Leinster, in league with the Viking king of Dublin, against Brian's overlordship, with the aid of foreign Vikings. Sean Duffy, in a recent comprehensive review of the evidence, asserts that, while it was a contest between two Irish kings, it did, in fact, save Ireland from a new onslaught by Vikings. This stair-restoration project continues the excellent work of restoration in the Cemetery. It was the second opening by Brian Hayes in the last six months, the previous being the opening of a gate between the Cemetery and the National Botanic Gardens. The cemetery Museum & Café has topped the Tripadvisor list of "Things to do in Dublin," and, at the present moment, is ranked 3rd. (This is a feather in the cap of the Finglas Road Action Group, who pointed out 30 years ago that the Cemetery, a national treasure, could be a top attraction if tidied up). Other future improvements we are looking forward to, for the benefit of citizens and tourists include the provision of Dublinbike stands at the entrance to both the Cemetery and the Botanic Gardens. Then one will be able to cycle to one venue and, after an interesting tour of both and a meal at one of the restaurants, exit from the other to pick up a Dublinbike and cycle home.